We understand that your property is a big investment and we want our customers to know that we are there for them to help them accomplish the dreams that they may have for there property. When most people think of fencing, they would think of panel fencing. Panel fencing can be built in a variety of styles using different combinations of posts and panels. 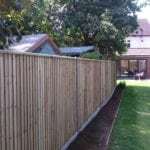 Closeboard panels are ideal for side boundary fencing, along public footpaths and gardens with children playing. Close board panels are the strongest fence you can get – perfect for surviving football hits! We understand that your property is a big investment and we want our customers to know that we are here to help and advise them on the best and most economical way to fit their Panel fencing. At MacDonald Fencing & Son Ltd specialise in providing a personalised service. Interested in using panel fencing for your next domestic or commercial project? Please contact us.